Portland artist Whitney Nye explores composition through gesture and the intersection of texture and color. In this exhibition she continues to experiment with her interest in abstract oil and acrylic paintings that suggest movement and light. This body of work is in response to how Nye, an urban dweller, is keenly aware of how the environment she is in is rapidly changing in front of her in a stressful way. Her response to this is to create an alternate environment through painting so that she gains more awareness and quiet as she surrounds herself with a “site” that quenches the desire for a more nourishing view. Through the physicality of large-scale painting she is able to this, to create a site of adequate scale. For Nye, it is about creating new pathways while honoring the past. 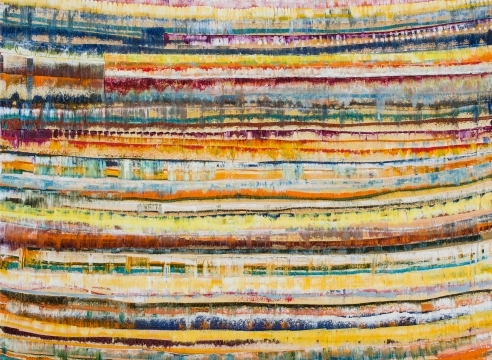 Speaking of this direction in her work, which she introduced in her 2013 show, she notes that “these paintings have a few or many layers, stories hide underneath, but what you see is the captured abstraction, the still of an animated surface.” Nye’s tradition of incorporating pattern and collage echoes within these new, painted canvases. Motion, rhythm and energy fill their surfaces. A University of Oregon graduate, Whitney Nye was also an artist in residence at the Oregon College of Art and Craft and at Bullseye Glass Company in Portland, Oregon. She has exhibited her work for over 15 years, and is represented by galleries in Tennessee, Wyoming, and Utah, as well as at Laura Russo Gallery in Oregon. Her work is included in a variety of private and public collections, including Oregon Health Sciences University and Providence Health Systems in Portland, Oregon, The University of Oregon, Eugene, OR, and Vanderbilt University Medical Center in Nashville, TN. Most recently her work was included in the exhibitions The Female Figure: Artistic Multiplicities, at the Jordan Schnitzer Museum of Art, University of Oregon in Eugene.